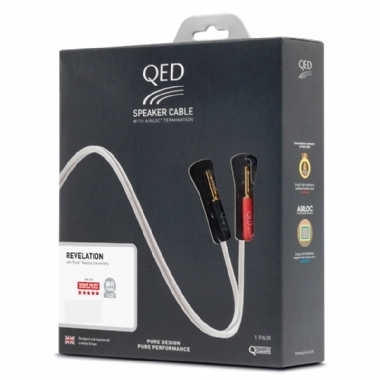 QED Signature Revelation Pre-Packaged Airloc Terminated Speaker Cables. Terminated with QED Airloc 4mm banana plugs and available in 2m, 3m, or 5m boxed pairs of speaker cable. ‘Revelation’ speaker cable lives up to its name and delivers unprecedented sonic performance at a price comfortably affordable by all Hi-Fi and home cinema enthusiasts. This cable is a miniaturized version of our flagship ‘Genesis’ cable and features Teflon dielectrics to maintain its low impedance.